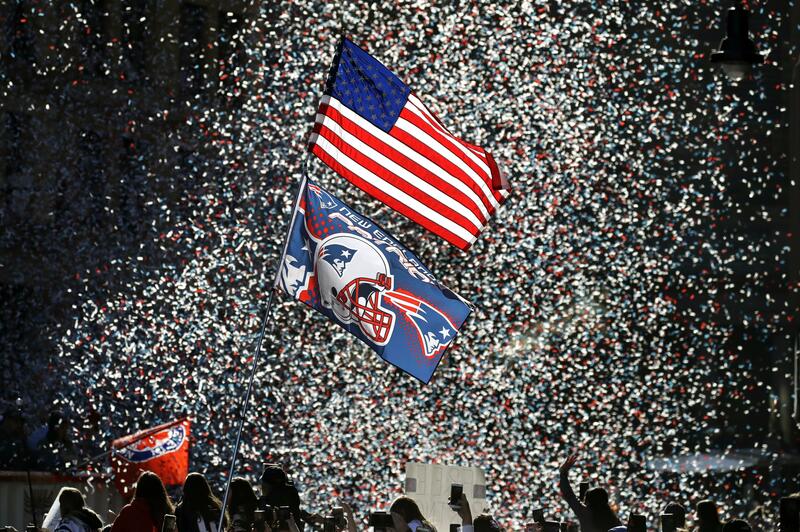 UPDATED: Tue., Feb. 5, 2019, 3:42 p.m.
BOSTON – With cheers of “We want seven!” and “Next year, right here!” hundreds of thousands of jubilant fans jammed downtown Boston on Tuesday for a parade celebrating the New England Patriots’ sixth Super Bowl title. It’s a familiar feeling in Boston. The city’s teams have now won twelve championships since 2001. Just four months ago, the city feted the Red Sox for their World Series victory over another Los Angeles team, the Dodgers. Boston resident Tom Collins was beaming as he took in the spectacle across from the city’s historic Common, his ticket from this year’s Super Bowl dangling from a lanyard around his neck. Players also waved large signs that read, “We Got Everything” – a twist on the team’s motivational hashtag, “Everything We Got,” that had become a theme this season. Police made at least a dozen arrests and emergency medical officials transported 34 revelers to area hospitals. Five of those arrested were involved in a brawl that happened near the parade’s end and at least seven of the arrests were juveniles, Boyle said. Fans seemed to mostly honor Mayor Marty Walsh’s pleas not to throw anything at the team. Errant beer cans slightly damaged the Red Sox World Series trophy last year. Unlike in past years, there was no post-parade rally with speeches from Brady and others. Regardless, Patriots fans made it clear they weren’t ready for the good times to end. Published: Feb. 5, 2019, 8:47 a.m. Updated: Feb. 5, 2019, 3:42 p.m.